National Young Farmers Coalition | "An Entrepreneur’s Guide to Farming in Massachusetts" Now Released! The guide covers everything from finding land to business management to resources on developing farming infrastructure. 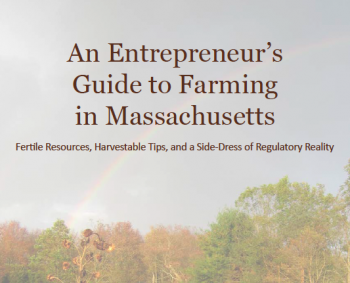 While the guide is intended for Massachusetts-based farmers (and many of the resources are state-specific), anyone looking for advice and ideas should take a look. The guide can be downloaded for free, either as one complete packet or as individual fact sheets. Whether you’re just starting to think about farming or planning on expanding your operating farm, this information is for you! Download it for free from the New Entry Sustainable Farming Project or from the Beginning Farmer Network of Massachusetts website. You can also contact New Entry directly at nesfp@tufts.edu or 978-654-6745.